Since our inception, KCI has continued to tackle large jobs in both the outside plant and inside cabling environments in the Mid-Atlantic region. The completion times for these jobs have lasted up to 18 months. However, the majority of our work comes in the form of smaller jobs, with completion times from one day to four weeks. The work force at KCI is knowledgeable and efficient within our work environment. We average just over twelve years of experience in the communications industry per employee. Our work force has an average of eight years of service to KCI. Because we have stayed small and because we have low worker turnover, KCI is extremely flexible with scheduling. We have the ability to start jobs with as little as one week notice to proceed (depending upon availability of the materials needed for the job). If you need to get a copper or fiber cable from point A to point B, inside a single building or from one campus location to another, chances are that KCI will be able to get the job done in a timely and professional manner. If you need communications cable installed, give us a call. We will have one of our staff visit your site. We can work from your scope of work or we can write the scope of work for you. We will then present a price quotation for KCI to do the work. It’s that simple. 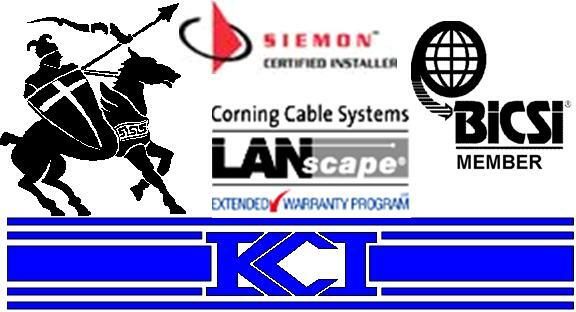 Large or small, KCI can meet your cable installations needs.